Throughout her life, Allison Johnson has been practicing and studying yoga. She recently studied at the Himalayan Yoga and Meditation Center in Palatine, IL, earning a 200 hour teacher training certificate during a year-long program. She believes in cultivating a healthy and harmonious mind, body and spirit through exercise, nutrition, meditation, and a positive outlook. She has experienced yoga as a beautiful path to health and vitality and wants to share those benefits with others through her classes. 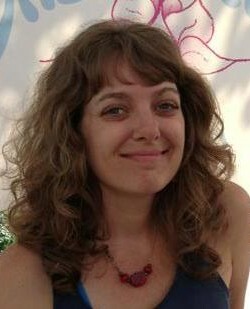 Allison lives in DeKalb and is a jewelry artist and teacher. Allison’s classes can be described as Hatha Flow. Expect to stay in classic asanas for several long, smooth, and deep breaths; allowing for the body to release and soften further, and awareness to deepen through each breath. Flow through a new series of asanas each class, specially designed for healing, quieting, strengthening, and relaxing the body, mind, and spirit. Meditation and Pranayama are explored and relevant insights regarding yogic philosophies are shared.